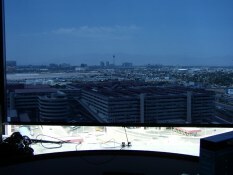 F72 Dark Gray .005 mil / Non Reflective Outside Current FAA approved material for Airport Traffic Control Towers in over 75 nations worldwide. Three ply laminate - two sheets neutral smoke gray .001 gauges, one side "hard coat/scratch resistant" to minimize surface self scratching. 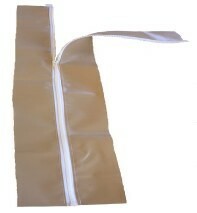 Middle sheeting .003 gauge, is neutralized to aid in heat gain/loss. Has superior "lay-flat" characteristics and superb optical clarity. Reflects 60.5% of total solar energy with 4% light transmission. Percentage of visible light transmittance (VLT) refers only to the amount of visible wavelengths of light that is transmitted, i.e. how much sunlight is allowed to enter. The lower the percentage, the less light and greater glare protection. Percentage of solar reflectance is the ratio of the total visible solar energy that is reflected by the shade material. Percentage of solar energy transmittance is the ratio of the amount of total solar energy in the full solar wavelength range that passes directly through the shade material. Winter U Value is expressed in terms of BTU/Sq. Ft. per HR/F and is the overall heat transfer coefficient of the material. It is a measure of the insulation capabilities of the glass and film in reducing heat flow in either direction. The U factor measures heat conduction from sources other than radiant. The lower the number the better the insulating capability. Percentage of solar absorption is the ratio of the amount of total solar radiation energy that the material prevents from passing through, i.e. how much of the heat is being blocked or prevented from directly passing through the shade material. 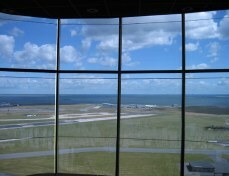 Shading Coefficient is the ratio of solar heat gain of any glazing system compared to untreated clear glass. The lower the number, the more effective the material is in keeping radiant solar heat out. For example, Duplex Ice has a shading coefficient of only .29 which means that only 29% of the radiant heat is allowed to pass...a full 71% is reflected. Percentage of total energy rejected is the amount of solar energy/heat that is reflected and absorbed and takes into consideration the NI Factor, which is how much of the absorbed energy is re-radiated inward. Re-radiate furnace heat back inside the room! 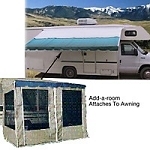 Reduce air infiltration in all climates! Minimize discomforting room "hot spots"! Eliminate virtually all direct and reflected eye-straining glare! Protect all interior furnishings! ...from the devastating effects of exposure to excessive heat and ultraviolet radiation. Block out up to 99% of the fade causing UV rays, helping to ensure longevity and color stability of draperies, carpeting, and furniture. Maximize your control! ...over changing weather and environmental conditions. As they change, your shade adjusts to preference. Help to reduce exterior noise! Benefit from the many features and functions not provided by ordinary window coverings! Make your conventional, inferior window insulation products obsolete! Most of us are aware of how valuable good insulation is, and in fact, probably already have some type of insulation for the walls and ceilings. 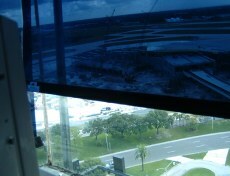 However, in many cases the SINGLE LARGEST ENERGY WASTE AREA HAS BEEN NEGLECTED...THE WINDOWS. It has been estimated that 20% of our nation's yearly energy production is consumed in the space conditioning of residential and commercial buildings, with windows accounting for a very disproportionate 25% or 1.7 MILLION BARRELS OF OIL PER DAY. Energy escapes at a rate of 10-13 times faster through windows than any other surface, and over 2/3 of the salvageable energy is lost at the window area. What this boils down to is that YOUR MONEY IS LITERALLY GOING OUT THE WINDOW! 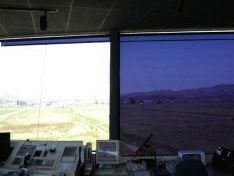 Plastic View reflective solar control "See-Thru" window shades have the energy efficiency and flexibility that is required to combat this tremendous energy/dollar loss. PLASTIC-VIEW shades are an excellent investment with a rapid return-on-investment of only one to three years. Our heat reflective shades perform as a passive solar system that allows all of the available free solar heating to enter when up, or when in the down position, reduce cold air infiltration while retaining and re-radiating precious interior heat back inside the room. PLASTIC-VIEW metallized materials have a "thermos bottle" effect on windows. In cold weather, cold air penetration is limited and the interior warmth is kept inside. In hot weather, the heat is reflected away and the coolness retained. During the hours of direct sunlight on any window, Solar shades conveniently raise to allow 100% of the available free solar heating and natural light to enter. As the sun angle changes, PLASTIC-VIEW shades are easily lowered, trapping the free solar energy inside the room. This reduces the need for any additional and costly heating. At night, PLASTIC-VIEW shades should remain in the down position. This results in an insulated air space between the window and shade, reducing the cold air infiltration. PLASTIC-VIEW heat reflective shades also re-radiate convective furnace (manmade) energy back inside the room for additional heat savings that would have ordinarily been lost. PLASTIC-VIEW heat reflective shades are a by-product of the U.S. space program. The precision metallization control technology produces the incredibly high total solar energy rejection of up to 94.9%, while still maintaining excellent optical clarity. By reflecting excess solar energy back through the glass, inside temperatures are kept more comfortable. In many cases this eliminates the need for air conditioning altogether, or at least decreases the demand and strain on existing equipment. Smaller and more economical machines may be utilized to satisfy air conditioning requirements. window comfortable, then others in the room away from the window are cold. WITH HEAT REFLECTIVE SHADES, the temperatures becomes more uniform and the working environment is far more comfortable for everyone. UV radiation is the main factor responsible for skin cancers, including basal cell carcinoma (BCC), squamous cell carcinoma (SCC) and possibly melanoma. In fact, the National Institutes of Health and the World Health Organization have identified broad spectrum UV as a human carcinogen. According to the American Skin Cancer Foundation, UVA is long wavelength (320-400 nm) UV and accounts for up to 95 percent of the solar UV radiation reaching the Earth's surface. It can penetrate into the deeper layers of the skin and has for years been thought to play a major part in skin aging and wrinkling. Importantly, recent studies strongly suggest that it may also initiate and exacerbate the development of skin cancers. UVA rays are present during all daylight hours and throughout the winter months. Although UVA rays are less intense than UVB rays, they are present all year round and depending upon the time of the year, can be 30 to 50 times more prevalent than UVB rays. Furthermore, UVA radiation can penetrate glass and clouds. Thus, we are exposed to large doses of UVA throughout our lifetime. The Rollease clutch bead chain mechanism is perfect for small, medium, or large size windows that are high or difficult to reach or that span from floor to ceiling. The Rollease mechanism can be mounted in three different ways. Inside window jam mount, outside window wall mount, and ceiling mount. Universal brackets are provided with all Rollease Clutch bead chain mechanisms and can be used for either of the three different mounting options. Roller shades that must fit inside a fixed window or door JAM to JAM dimension must include allowances for the roller pins and the width of the mounting brackets. If the actual mylar material on a roller shade must be wide enough to cover the exposed area of a window or door, then allowances must be made for the roller pins and the width of the mounting brackets. Locking side universal bracket. (Rollease). Designed for the square pin with swivel lock on standard roll shade applications. Clutch side universal bracket. (Rollease). Designed for the clutch insert pin on standard roll shade applications. The Rollease brackets may be used wherever there is 2 inches of depth inside the window boxing to accommodate the roller. Roller shades that must fit inside a fixed window or door JAM to JAM dimension must include allowances for the roller pins and the width of the mounting brackets. The Rollease brackets mount on the frame of the outside of the window or on the wall adjacent to the window facing the room. It is needed where there is no space on the inside of the window frame. It is also used where it is desirable to cover inner edges of a window frame, or for shades wider than the windows. The Rollease brackets mount to the ceiling above the window. Particularly useful on ceiling - high windows, bay windows, or those with deep recesses, and sliding glass doors. Also useful on an overhang above the windows. All Plastic View solar roller shades are custom fabricated to your specific width and height. To proceed with ordering, accurately measure the inside jam to jam width and height of each window boxing. Scroll back to the ordering section on this page. For individual roller shade pricing, make a selection from the pricing list which correctly captures both the inside jam to jam width and height dimensions of your window. For example, if your exact inside jam to jam width dimension is 36" and your exact height dimension is 48", then you would make the selection from the list indicating "Inside jam to jam window boxing width up to 37 1/4" and height up to 58" high, cost $154.00 per shade. This is your price per roller shade with your dimensions. Select your quantity, and add the roller shade to the shopping cart. Follow the same procedure for additional roller shades with different dimensions. Process your final order accordingly through the secure shopping cart. Your order will then be received and reviewed by a professional in our customer service department. You will be contacted to verify all dimensions and information before production will begin. 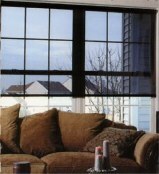 All Plastic View solar roller shades are excellent for retaining interior heat on cold days. The Plastic View shade creates a flexible "Duo-Pane" effect. In cold weather the shade should be down at all times. Raise shades only when in direct sunlight on any given window to allow free solar energy to enter the room. When the window is no longer affected by the direct sunlight, lower the shade to trap the solar and furnace heat energy inside. Also keep shades lowered at night to reduce cold air infiltration and retain interior heat. Keep shades down at all times. This will help reduce the unwanted solar energy entering through the window areas and also reduce demands on any air conditioning systems that are present. Raise shades only in the event of a cooling trend or to allow for a breeze if present and desired. To clean, simply dust off the shade material with a slight damp, soft cloth; once a month usually will do. (Most of the dust will accumulate on the bottom 12" of the shade.) Smudges wipe off easily this way too. Neglected shades may require a 1/2 Windex, 1/2 water mixture, or Formula 409 at full strength, or any other non-abrasive cleaner (dilute ammonia-heavy solutions with water to minimize streaking). Should the material ever get cut, place a clear cellophane tape patch over the cut on both sides. Black electrical tape is excellent on dark colored materials. We stand behind our products. We warrant our roller shade products to be free from manufacturing defects for a period of one year from the date of purchase. Our roller shades are each custom built to the proper specifications. Orders for custom built roller shades must be prepaid in advance and are non-returnable. DO NOT RETURN ANY DAMAGED GOODS TO THE FACTORY. Any damages MUST be inspected at the receiving point by the transportation company. If a shipment reaches you in a damaged condition or the quantities do not check with those shown on the freight bill, be sure to get, at the time of delivery, the carrier's freight agent's notation on both the receipt and freight bill showing the shortage or damage involved. If the boxes, crates or cartons in which our merchandise is packed reach you in apparent good condition, but upon opening a carton you find some contents to be missing or damaged, be sure to call the delivering carrier's freight agent immediately, so that they can examine the shipping carton and its contents and make a Concealed Damage Report. Note this information on the face of the original freight bill. Be sure to open and inspect all shipments within 10 days and submit your claim to the carrier promptly if any merchandise is damaged. Retain the merchandise in the original cartons and packages for inspection. We do not assume responsibility for merchandise lost or damaged while in transit..
We will not accept return of any merchandise whether damaged, or for any reason, unless permission has first been issued IN WRITING, via a factory return authorization number. We are willing to assist you in any possible manner in collecting claims for loss or damage, but this willingness on our part does not make us responsible for collection of claims or replacement of the material.